Tiger PAWS (Parents Association Working for Students) is a 501(c)(3) charitable organization committed to assuring Wheaton Warrenville South students have a well-rounded high school experience. 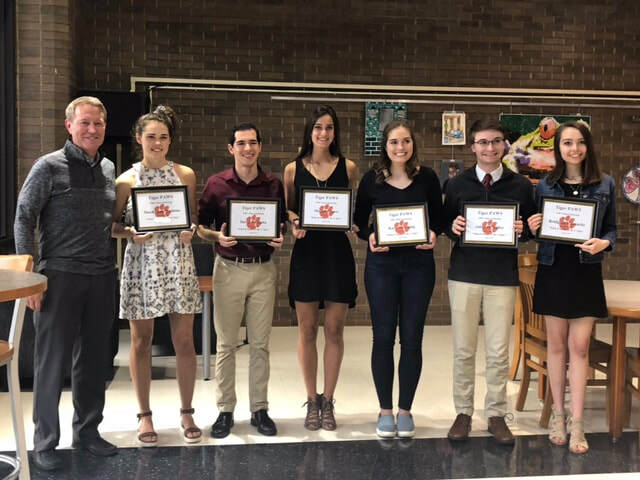 Through fundraising and volunteerism, we provide support for academic achievement and school-sponsored teams, clubs and extra curricular activities at Wheaton Warrenville South High School. BECOME A MEMBER OF TIGER PAWS! Membership is now closed for the 2018-2019 school year. Congratulations to the recipients of this year's Tiger PAWS scholarships! MacKenzie Stebbins, David Taullahu, Maggie Moore, Kara Struebing, Aidan O'Malley, and Bridgette Garnache. Please note: As of April 15, online ordering for the 2019-2020 school year will not be available until June 15th. Our website, Facebook page, email blasts, activity programs and Red Grange Stadium ads reach thousands of people. If you are interested in supporting your community and becoming a Tiger PAWS sponsor in exchange for advertisement please click the button below. Last 2 Tiger Wear Sale Dates for 2018-2019! That's all for this school year! Looking to donate some items after a fall closet clean out? Drop off your items at Family Tree Resale, 310 E Geneva Rd in Wheaton. Your donation helps support CUSD 200 families in need. When donating, be sure to mention you're donating on behalf of District 200. Family Tree supports District 200 families in need through vouchers for clothing and other household items.